This Niagara Falls live cam lets you experience Niagara Falls from anywhere. Niagara Falls live stream allows you to view the beauty of this natural wonder right from home. Wondering where is Niagara Falls? It is the boundary between the United States and Canada. There are falls on both sides. The United States side is in the upper most part of New York State. Most people associate the falls with the NYS side of the falls. The falls are compromised of three falls. The Canadian Falls (Horseshoe Falls) American Falls and the Bridal Falls. The American Falls are the tallest of the three at 176 feet while the Bridal Falls which looks a lot like the American Falls is the smallest. The falls come from the Niagara River which is fed by the Great Lakes. Power is harnessed from this powerful body of water and supplies much of New York State and Ontario Canada with electricity. It is the 8th Natural Wonder of the World. While it is not the highest falls, it is simply spectacular. At night flood lights are used to highlight the falls in different colors. There is a long history of crazy stunts attached to the falls. Many people have gone over the falls in a barrel. Many people did not live to tell the tale. The falls on the US side are surrounded by one of the first National Parks with beautiful natural areas that are protected. 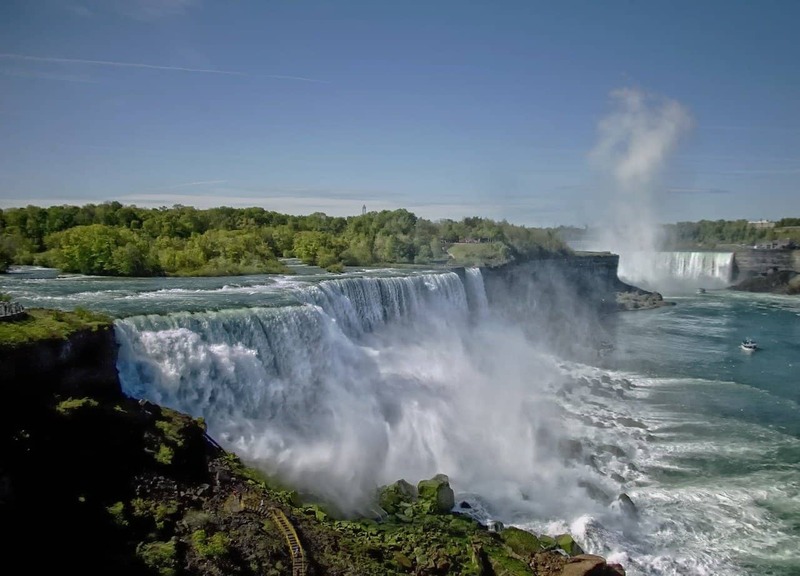 Millions of people from around the globe visit the falls annually. You can “visit” to via the Niagara Falls live feed. Population: The actual city closest to Niagara Falls on the US side has a modest population of about 45,000 residents. Niagara Falls Canada has a population of about 88,000. Main Attraction: The falls and the parks surrounding them.